Another Deborah Miller book—and about time. Her poems get better and better: short lyrics that compress anger, humour and vulnerability into vivid speech. And what she talks about! Slavery, racism, dislocation, the Holocaust, Israel-Palestine, death, murder, miscarriage, disease. She shows us that our greatest crimes are our willful ignorance of history and our fearful accommodation to power. All this is to be expected from Deborah Miller. The surprise in this collection is the rollicking Pamela sequence: a hilarious and awful look at menopausal life. It’s as if Nora Ephron were being told, “So you hate your neck. Big deal. Let me tell you what it’s like for us ordinary women without New York apartments.” Landing at Night is a fine collection from a poet who is often very funny and always deeply passionate. 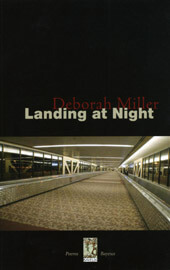 There is a gentle, wistful wisdom that sings with quiet eloquence in the poems of Deborah Miller. Whether she is responding to the mundane daily fare of contemporary living, or to remembered moments of her bayou country past, or the intensely poignant and potent memories of her father, these poems really soar and Landing at Night is well worth the flight.